The area was first settled around 2000BC and developed and declined over the next 1000 years. 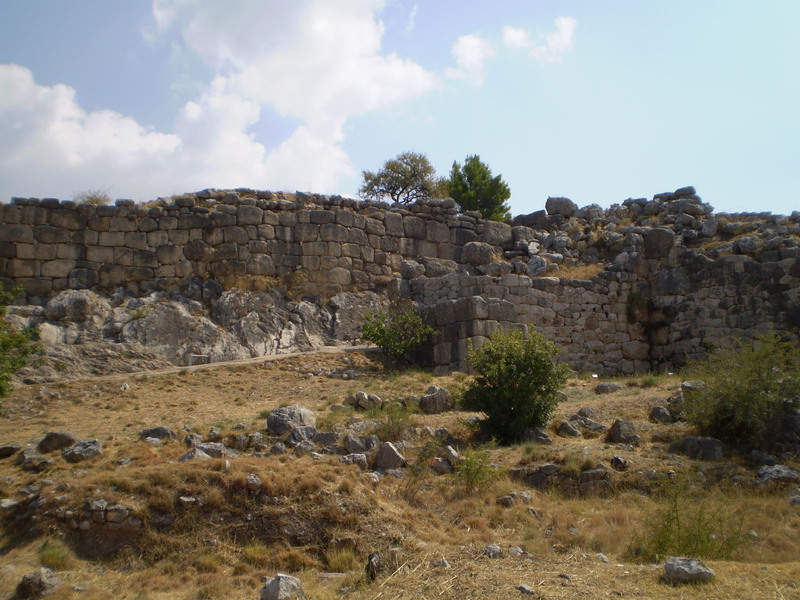 The most notable outer walls composed of 10 ton stones were constructed around 1350BC. While this was done one thousand years after the Great Pyramid of Giza, the Mycenaeans had rocker terrain to contend with and built their fortress on the top of a small mountain. Many people believed that only the mythical giant Cyclops people could have built these ramparts and so you often hear them referred to as “Cyclopean Walls”. The one main decorative element of the site is the Lion’s Gate. Two lionesses stand perched with their forelegs on a trophy over a heavy doorway. Their heads have been lost but were likely turned aggressively toward travelers below who entered the citadel. I prefer the less decorative but highly defense-able back entrance to the fort which forced invaders up a tight switch back road leaving their shields useless. The site also contains two grave circles which were excavated in the 19th century by Heinrich Schliemann. 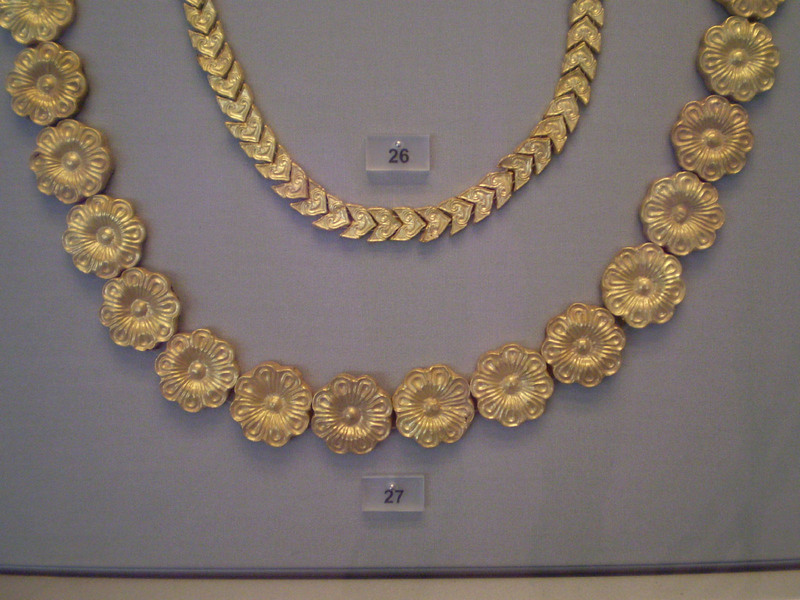 The treasure of gold he discovered there is now on display in the National Archaeological Museum in Athens. These items are believed to have belonged to Agamemnon and his family, the House of Atreus, which according to legend ended tragically and was linked to their involvement in the Trojan War. 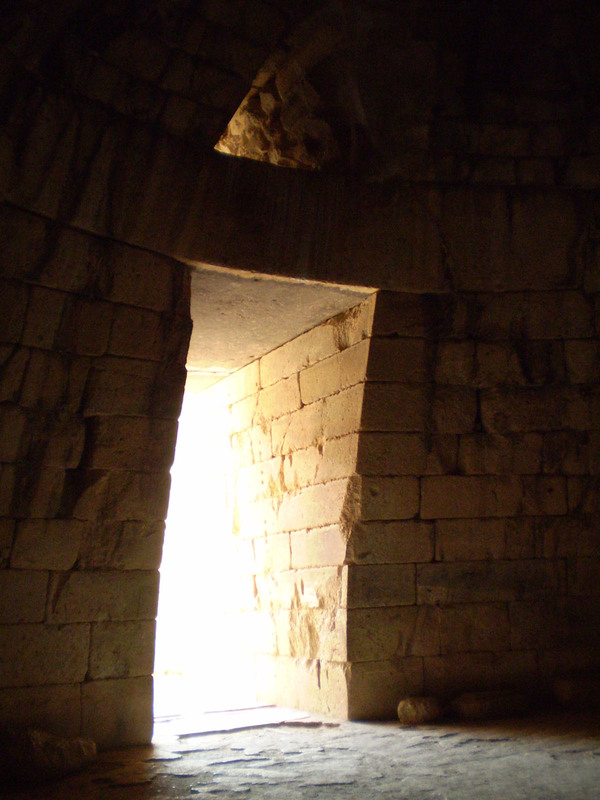 In addition to the grave circles, there are several large Tholos tombs. These are 2-3 story chambers constructed of tightly fitted stones that slowly corbel into a dome. By mid-day when we got to these rooms, they were a cool escape. 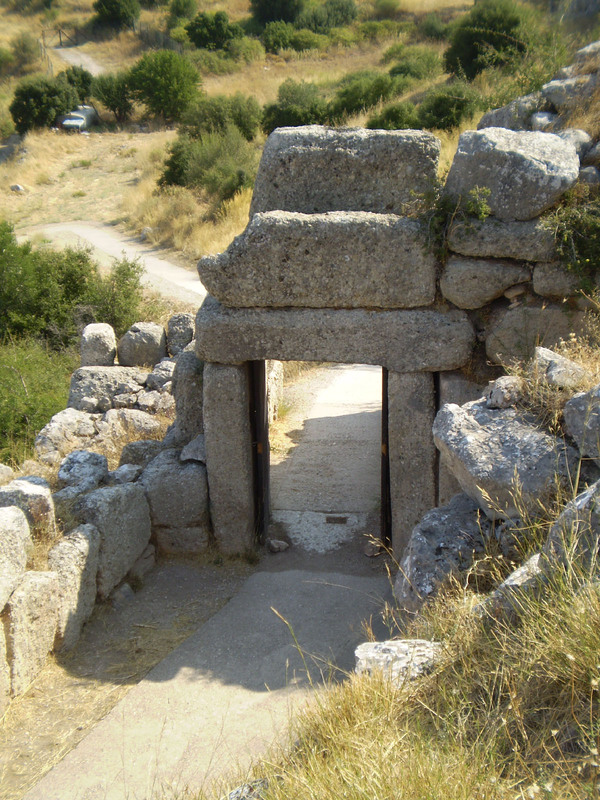 The two Tholos tombs at the smaller site of Tiryn nearby are down a rural farming road – definitely off the beaten trail! 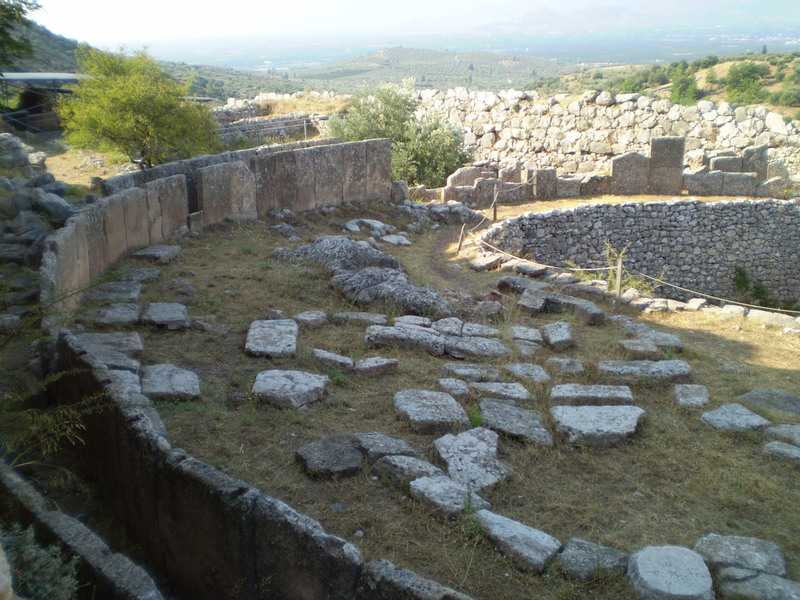 If you do visit Mycenae, take a flashlight! It’s still possible to go down a flight of stone steps to the fortress’ underground cistern which provided fresh water during long sieges. It’s a creepy, spiderweb filled descent. I wimped out once the stairs started getting wet and slippery but it’s pretty cool and you’ll feel like quite the adventurer! 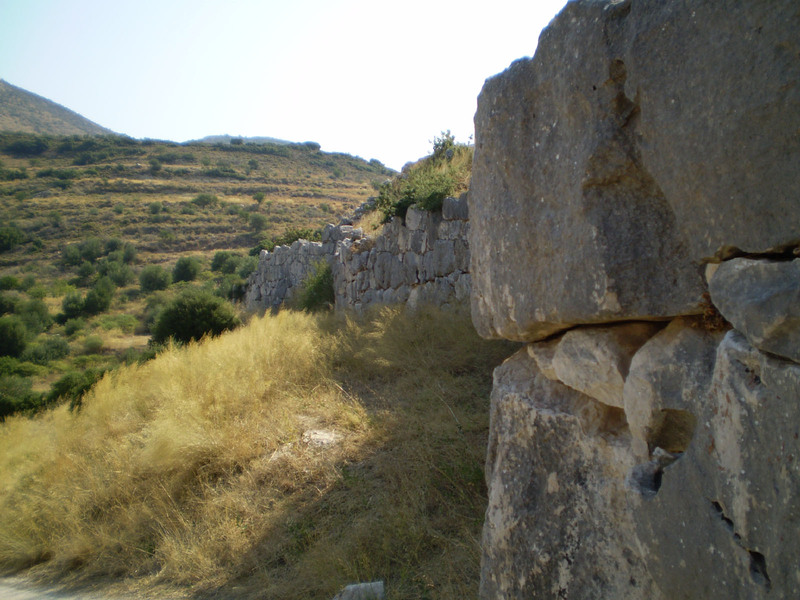 Mycenae is an easy half-day or day trip from Nafplio. Bring snacks and water because there is nothing available at the site. Mycenae has a small archaeological museum with pottery and very dated signage about the site which doesn’t take long to see. 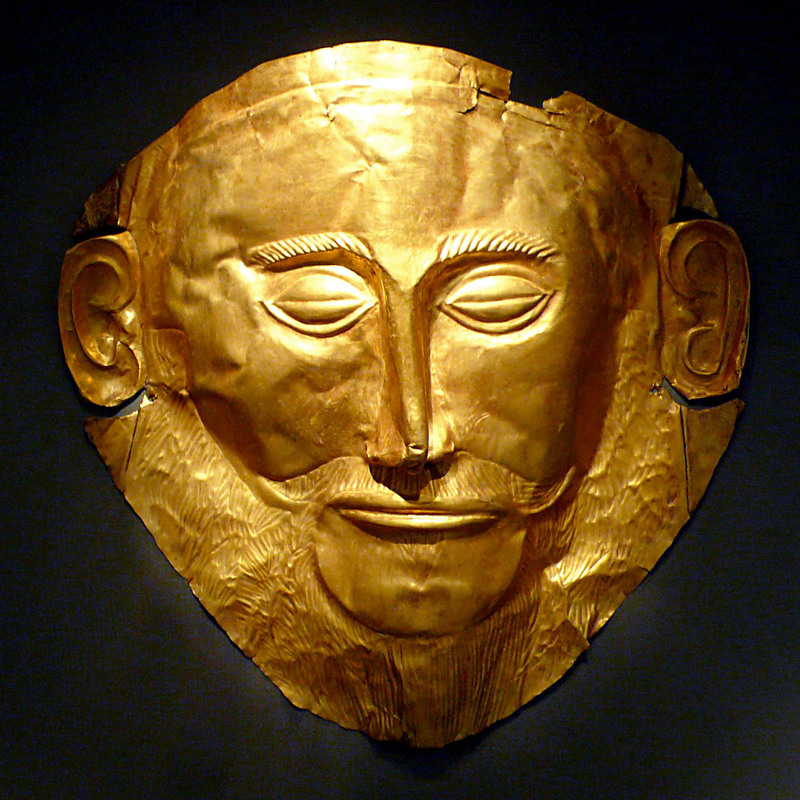 But then again, you are at Mycenae for those Cyclopean Walls. Fascinating. These lesser-known places are often just as interesting as their popular counterparts but have somehow been sidestepped by tours and tv shows. Thanks for all the information. Thanks, that’s why I like to catch a few UNESCO sites every time I travel someplace new. It is interesting how that main entrance looks similar to the main entrance to the Inca ruins at Ollantaytambo. With this post, I wonder to myself just how many UNESCO world heritage sites I have seen. May be an interesting thing to figure out. Have a great day. I hadn’t connected the Greek ruins with the Inca, but it is definitely there. The UNESCO list is so rich with natural and archaeological site. You should figure out how many you’ve seen and which ones are next!